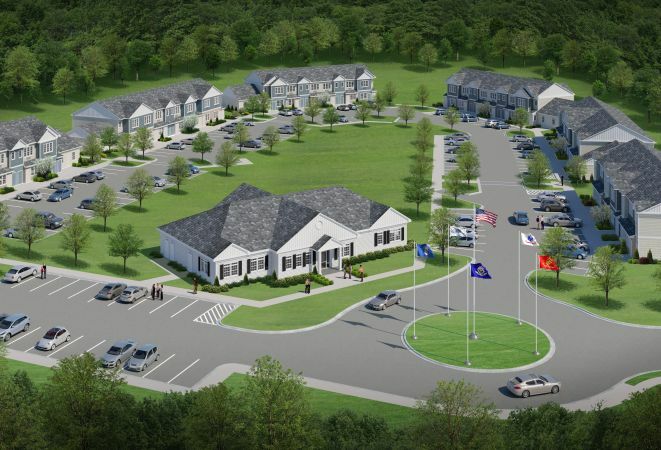 GETTING OFF THE GROUND: libn.com – Concern for Independent Living Inc.
Concern for Independent Living broke ground on a $25 million, 77-unit affordable housing development in Port Jefferson Station this month. Plans for the development, of which 25 units [webmaster correction: 45 units] will be set aside for veterans or veteran-preferred, have been in the works for about 18 months, according to Ralph Fasano, executive director of the Medford-based nonprofit, which provides housing and supportive services to veterans and other needy individuals and families. The development will include six two-story buildings. All but four [webmaster correction: two] of the 77 units will be one-bedroom apartments of about 750 square feet each; the others will be two-bedroom units. The complex will also include a community center with a fitness center, library and computer room, along with staff offices. Beyond the 25 apartments earmarked for veterans, the remaining 42 units [webmaster correction: 32 units] are designated for people earning less than 60 percent of the area median income. Apartments will be offered by lottery. Rents will range from $750 to $900 for the one-bedroom units and $1,000 to $1,100 for the two-bedrooms. Concern for Independent Living broke ground immediately after closing on the purchase of the five-acre property, which was vacant land, from a private seller. The nonprofit, which currently serves clients in 1,300 housing units in Long Island, Brooklyn and the Bronx, is always on the lookout for properties that can be converted to affordable housing, Fasano said. The new development is near the intersection of Route 112 and East Grove Street, about a mile from the Port Jefferson Long Island Rail Road station. The parcel was desirable for several reasons, according to Fasano. Also, the property is not far from the company’s headquarters in Medford. The project moved through the approvals process fairly quickly, but initially, the community was “very wary of it, and they were leaning toward opposing it,” Fasano said. Further, the Town of Brookhaven “expedited many of the approvals,” Fasano said. Part of the appeal was that because the lion’s share of the units are one-bedroom, the development is not expected to bring too many families with children into the school district. When projects receive low-income housing tax relief, as this one did, there is increased pressure to limit the impact they will have on the local school district.